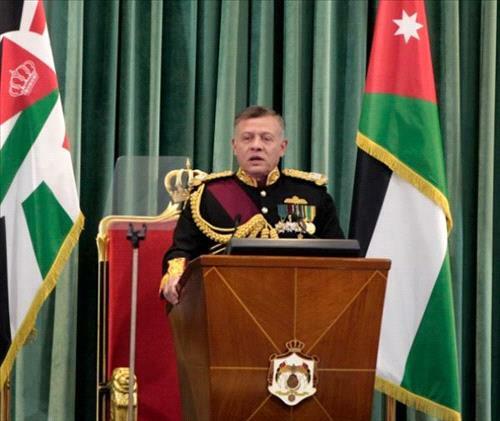 AMMONNEWS - His Majesty King Abdullah II on Sunday inaugurates the third ordinary session of the 18th Jordanian Parliament with the speech from the throne. After the address, members of the Senate and Lower House will shake hands with the King and then the Senate will hold its first session, which will be chaired by its president, Faisal Al Fayez, and during which the royal decrees will be read out; one proroguing the Parliament's extraordinary session as of Sept. 30, another adjourning the ordinary session until Oct. 14 and a third summoning it to meet in an ordinary session as of Oct 14. The Senate members will also choose members of the committee that will draft the response to the speech from the throne and elect the first and second deputy speakers and the aides to the president. The Lower House will then hold its first session and begin with a reciting of verses from the Holy Quran, to be followed by reading out the three royal decrees and then electing a speaker, two deputy speakers and two aides (permanent office). Also on the House's agenda are the choice of the committee to draft the response to the speech from the throne, which shall be endorsed by the legislature before passing it to the King within 14 days, and the election of the House's 20 permanent committees.